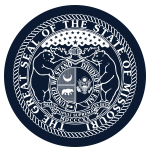 Mission: The Peace Officer Standards and Training Commission ensures the citizens of Missouri are provided with the best trained, most professional law enforcement officers. Function: The Peace Officer Standards and Training Commission establishes the core curriculum and formulates definitions, rules and regulations for the administration of the Peace Officer Standards and Training Program and advises the Director concerning duties as outlined by statute. Member Requirements: Three members of the POST commission shall be police chiefs, three members shall be sheriffs, one member shall represent a state law enforcement agency covered by the provisions of this chapter, two members shall be peace officers at or below the rank of sergeant employed by a political subdivision, and one member shall be a chief executive officer of a certified training academy. The public member shall be at the time of appointment a registered voter; a person who is not and never has been a member of any profession certified or regulated under this chapter or the spouse of such person; and a person who does not have and never has had a material financial interest in either the providing of the professional services regulated by this chapter, or an activity or organization directly related to any profession certified or regulated under this chapter. Geographic Requirements: no more than two members may reside in the same congressional district as any other at the time of their appointments, with the exception of the Civilian-At-Large.